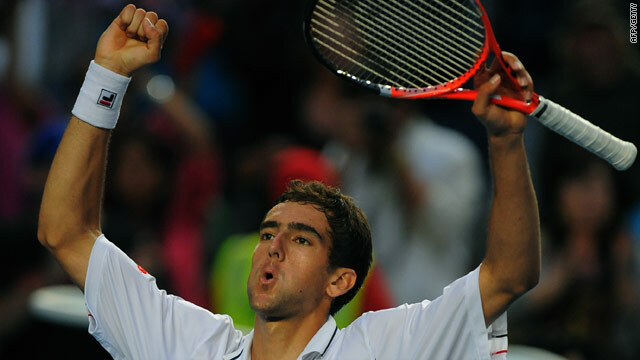 Cilic savors the biggest victory of his emerging career after claiming the scalp of Del Potro. (CNN) -- U.S. Open champion Juan Martin Del Potro was sent crashing from Australian Open by 14th seed Marin Cilic of Croatia in a marathon five-set match in Melbourne on Sunday. The fourth seed, who was bidding for back-to-back grand slam triumphs, was beaten 5-7 6-4 7-5 5-7 6-3 in the fourth round clash on Hisense Arena, running out of steam for the deciding set which Cilic took with a single break. The victory after four hours 38 minutes was revenge for Cilic, who was beaten at the Australian Open last year by the Argentine and also in the quarterfinals of the U.S. Open. Cilic will play seventh seed Andy Roddick in the quarterfinals after the American closed out victory over former runner-up Fernando Gonzalez of Chile in their five-setter, which ended in the early hours of the morning. Roddick looked set to crash out as he trailed by two sets to one, but he claimed the fourth set on a appeal to the TV replay system, leaving Gonzalez to smash his racket to the ground in frustration. Roddick dominated the decider to win 6-3 3-6 4-6 7-5 6-2. Cilic underlined his growing challenge by disposing of fellow giant Del Potro, who was clearly suffering the effects of marathon encounters which saw him play 18 sets in his four matches. "I've had some tough matches here in the first few rounds, but today I felt really good physically, and that in the end was the main difference," Cilic told gathered reporters. Earlier, defending champion Rafael Nadal earned a quarterfinal clash with fifth seed Andy Murray after beating Ivo Karlovic 6-4 4-6 6-4 6-4. The Spaniard faced a tough challenge as Karlovic, known for his big serve, rained down 28 aces during the match, compared to Nadal's two. However, the second seed showed his class by only committing 15 unforced errors, compared to the Croatian's 42. Murray earned his match with Nadal after defeating John Isner of the United States 7-6 6-3 6-2 in the first of the last 16 matches on Sunday. "Murray is very good, he's one of the most talented players on tour," Nadal told the Australian Open Web site when quizzed about their upcoming meeting. "He can play offensive, he can play defensive. He can do a lot of things during the same match ... He's a very important player."